During the spring of 1864, General Ulysses S. Grant initiated his Overland Campaign to defeat General Robert E. Lee and capture the Confederate capital of Richmond, Virginia. It would take until June before Grant and his forces would have Richmond surrounded. At almost the same time, Grant also besieged Lee and his Army of North Virginia at Petersburg, Virginia. Lee and his forces held the line in Petersburg for 10 months until he realized that he had to make a move. Lee knew that it was just a matter of time before General Sherman and his troops would be arriving from the Carolinas. Lee did not believe that the Confederacy could survive if Sherman joined forces with Grant. Lee was certain that his only hope was to break out of Petersburg and join up with General Joseph Johnston's men. He believed if they united forces they could defeat General Sherman in North Carolina. Unfortunately, before he could get there he had a bigger problem; he was running out of food and supplies. At the same time, his horses and draft animals were of poor condition and the roads were largely impassable because of harsh winter conditions. Lee decided to wait for the weather to improve. Then on April 2, !865, the rebels left their trenches and escaped. 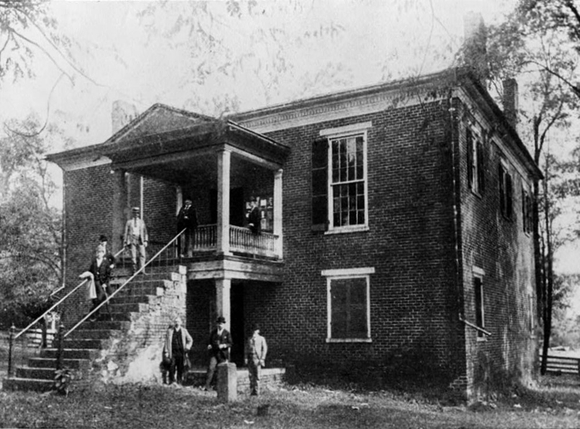 Before they escaped, Lee issued orders to regroup at the Amelia Courthouse where they would receive their badly needed food supplies from Richmond. From Richmond he intended to follow the Richmond Danville Railroad Line south until he united with Johnston and his men, but when they made their way to the courthouse they realized that their rations of food had not arrived. They were told that it had been delayed by bad weather. Lee's men were now starving. Without any alternatives he wasted valuable time sending his men and wagons into the countryside to get food, but they had little success. Soon afterward, Lee postponed his march to join Johnston. As a result, the extra time provided General Sherman with the time he needed to block Lee's path along the Richmond Danville Railroad Line. Consequently, Lee was forced to turn his troops westward towards Lynchburg. At this time, Lee had his Army of North Virginia marching day and night. They marched until both men and animals began dying of hunger and exhaustion. Then on April 6, 1865, the Union Army overran the Confederate forces at Saylor's Creek. After a brief battle 7,000 Confederate soldiers were captured, including six generals. No matter what the Confederate soldiers did not want to give up. At the break of dawn on April 9, General Lee decided to make one final assault on Appomattox Station. He placed General James B. Gordon in charge of the assault. A couple of hours later Gordon reported to Lee that his advance had been stopped. That afternoon at 4 o'clock, General Lee surrendered to General Ulysses S. Grant in Wilmer McLean’s parlor in the Appomattox Courthouse. On April 12, Lee's men marched past silent Union troops and turned over their arms. At the conclusion of the Appomattox Campaign, General Grant still had over 120,000 men. General Lee's Army of Northern Virginia had started the conflict with 50,000 men, but by the end of the battle they were left with only 26,765 men. Lee had lost almost 50% of his men to death, desertion, wounds, and capture. The fighting continued until May 26, at this time the last of the Confederate generals finally gave up. Many had wanted Lee to continue by breaking up into small guerrilla bands, but Lee realized that the time had come for healing. He had seen enough of the carnage.